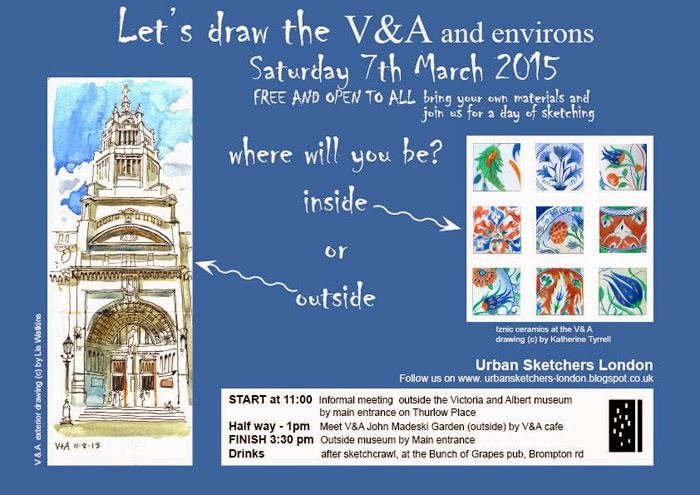 See above details for our next sketching event. If you want to plan your visit - see the V&A website. 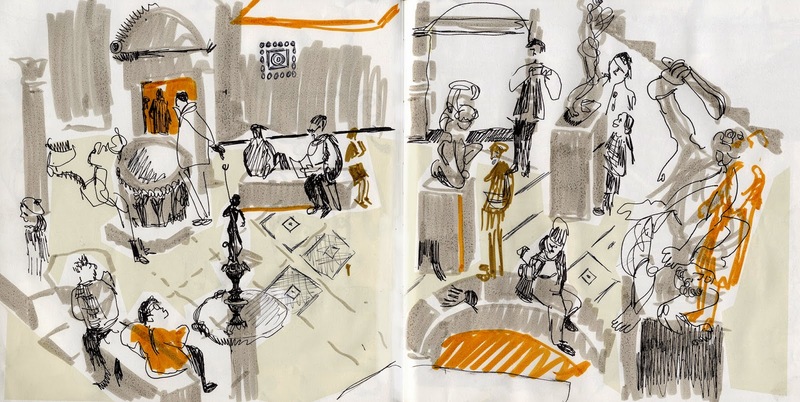 Please note that the V&A has restrictions on the materials that can be used for sketching in the galleries and where you can sketch - see for full information see the V&A Guidelines or see Making a Mark post on drawing on galleries and museums and look for the V&A (towards the end of the post). Given the restrictions and that I would like to use watercolours, I will be painting outside in the surrounding area on the day. 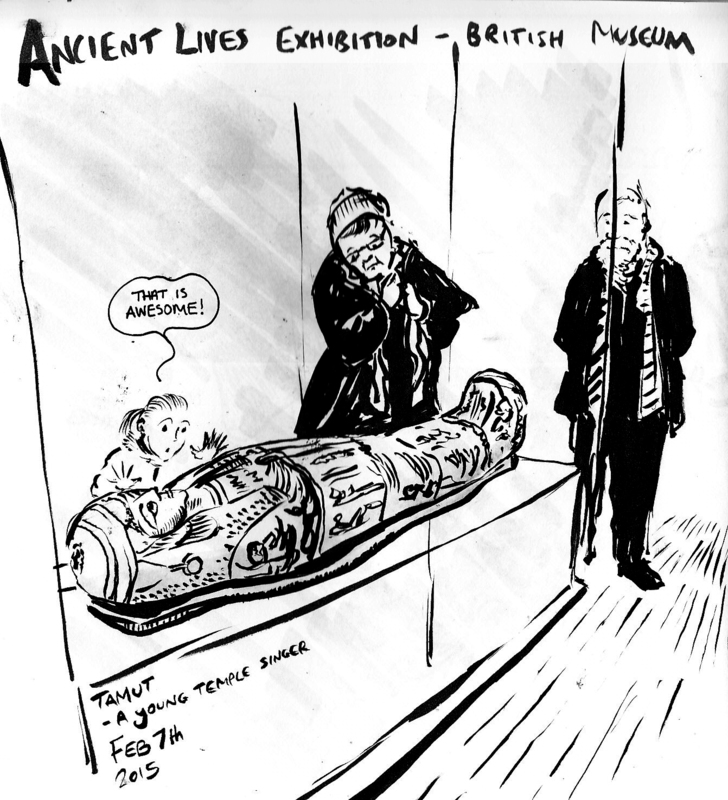 I enjoyed our visit to the British Museum last month and it was great to see so many faces some old friends and some new acquaintances - it makes sketching so much more fun! The morning went quickly around the Grand Court and looking at the architecture of the roof - quite a daunting task but it had to be tried out! I spent the afternoon around the Africa section and my imagination was caught by a great collection of square cast brass plaques from an old palace in Benin City - they depicted warriors but some looked positively westerners with bowler hats and some African - they all were surrounded by flowers - odd. The second object I drew was the Tree of Life - from Mozambique, made with bits of guns and other weapons handed over - very powerful how something so horrid can create a beautiful piece of art - a lot more peaceful. Above: I should point out that the mummy Tamut was actually a priest's daughter, not a temple singer; I confused my mummies there. Sometimes when you go around a museum, the visitors are just as interesting as the exhibits. As someone who always feels a bit self-concious drawing strangers up close and personal, being in a museum is the perfect alibi to do so undetected. You can stand by a display (preferably with your back to a wall, as people are always nosey and look over your shoulder) and sketch out the scene in front of you. Whenever someone interesting comes along to look at the artefact, I immediately start incorporating them. Normally they're too engrossed to notice, but if they do look up, I just go back to drawing the actual object, or details of the room. An added bonus is that people tend to stay still slightly longer than they would if just walking around in the street, so you have more time to capture their pose. 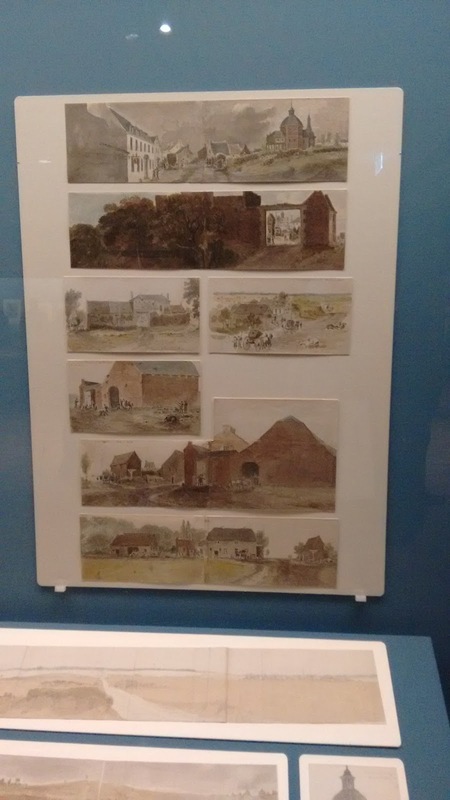 When I wasn't drawing, I was browsing around the museum, and I came across a rather different example of urban sketching - in the Napoleon exhibition there was displayed several watercolour sketches done by an anonymous (and, as the British Museum put it) "accomplished amateur artist" of the aftermath of the Battle of Waterloo. The surrounding villages are shown, a typical scene almost, if not for the wounded troops making their way through, while in the background, naked corpses lie, stripped of valuables and abandoned. The drawings are dated 2 days after the battle, but the sketchbook itself ended up in an attic in Ireland and was not found again until the 20th century. 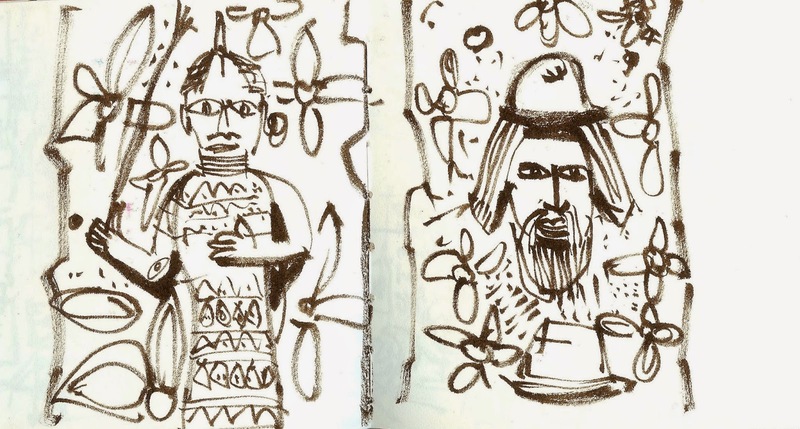 I find it oddly gratifying to see evidence of so-called "amateurs" in action throughout the ages; people inspired by events around them to get out their sketchbooks and record it as best they can. Sometimes, as in this case, they end up being valuable historical documents, but I don't believe that was the goal, nor should it be. Simply that by observing, we are able to make sense of things a little better. And that for me seems like a good enough reason for being a little less self-concious and to start sketching more! I am delighted to be a London correspondent. 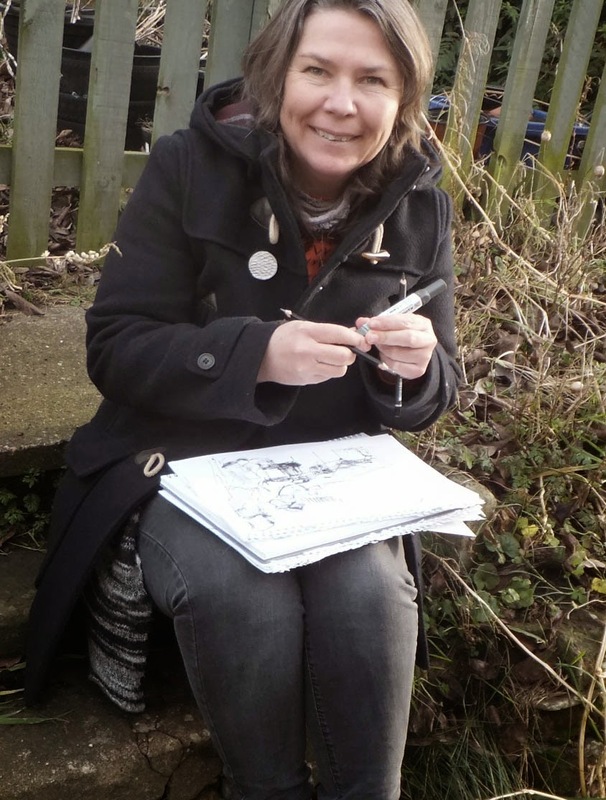 Although I live and work in Norwich Norfolk situated in the East of England, I’m often in London visiting family, art exhibitions and taking part in sketch crawls. The sketch crawls have introduced me to parts of London I have never explored before. I like the chaotic streets full of life and culture and especially enjoy the challenge of capturing busy markets, museums and people interacting with their surroundings. 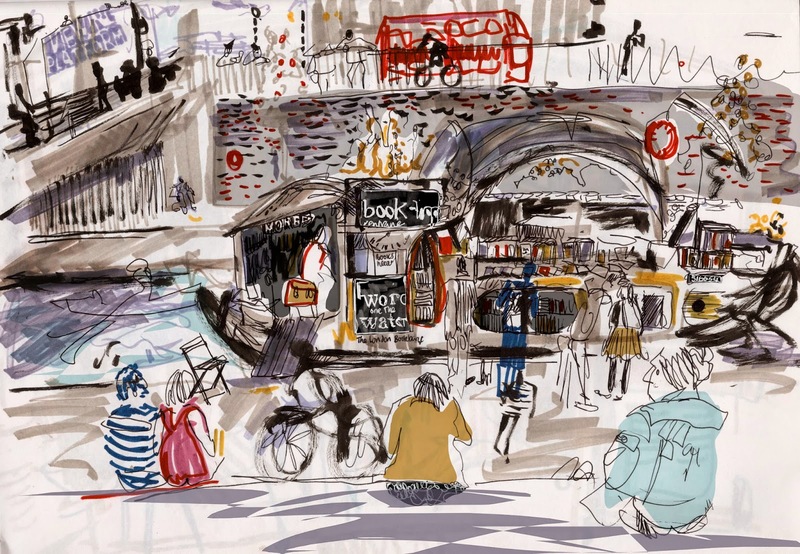 I stumbled across urban sketchers three years ago whilst ordering art books for work, and I was instantly captivated and filled with excitement that there were hundreds of people all over the world who shared the same passion. I haven’t stopped since. 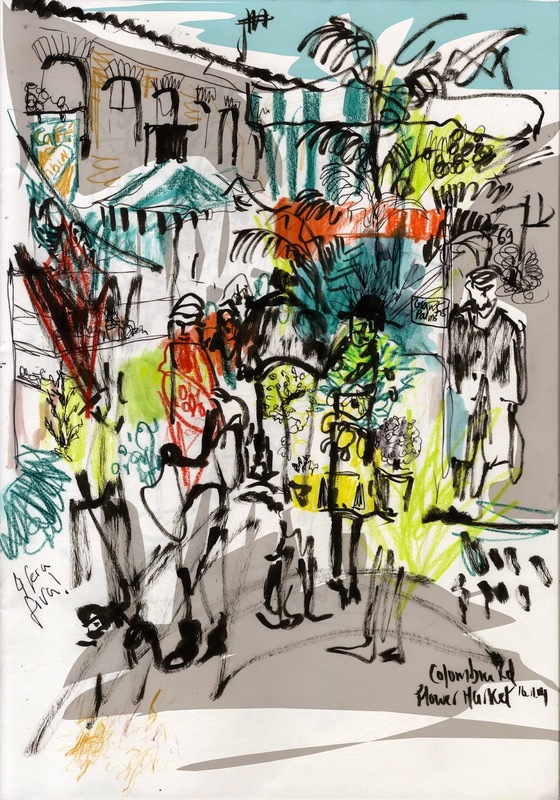 I used to sketch mainly on holidays but felt it was a lonely pursuit but discovering the urban sketchers has revitalized my love of drawing again. I used to do a lot of street photography but this has taken a back stage now. When I am out sketching I am observing, watching and sharing the experience rather than snapping the shutter and moving on. People have always been a focus of my drawing. 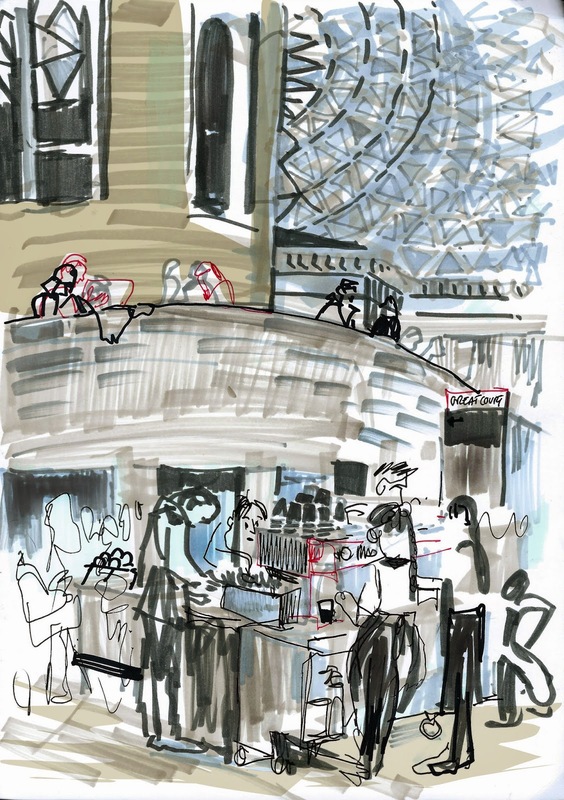 I first started sketching in cafes, as it seemed easier due to the comforts of a place to sit, lots of tea and cake and people stayed relatively still. I used a fine liner and then added colour digitally at home. As my confidence grew I started to be more experimental with media and taking on more challenging scenes and capturing movement. Buildings and perspective was something I always feared but now I love to capture the soul of a building and that includes the people that bring it to life. I like to capture the energy of a place. I enjoy experimenting with colour, at times using it to lead the eye to different narratives within a scene. I am drawn to letterforms and often start my sketch with type. Pattern attracts me to a scene and that’s what I enjoy about architecture its full of reoccurring patterns and shapes. I’m experimental with materials and mixed media mainly using different types of pens and pencils: brush, marker, dip, biro, watercolour pencils and graphite. When its not too windy I enjoying drawing with torn paper by picking out main shapes from the scene, or to break up space and put down a block of colour quickly. I do like to combine this with a bit of digital colouring. I was lucky to go on the Barcelona symposium, which was a fantastic experience, and I learnt so much from all the amazing workshops and people I met from all over the world who were really inspiring. I’m looking forward to blogging and the London sketch crawl lineup looks exciting have already marked them on the calendar! I teach Graphic Design/Illustration/Photography part time at a Sixth form college and I have just started an MA in Communication Design focusing on Reportage Illustration.